Judy of the Woods has instructions for these fantastic looking vegetable oil lamps. 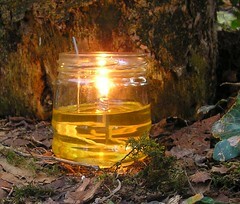 Judy used wire, wick, vegetable oil, a container and hand tools to make these oil lamps. I’ve made many beeswax candles over the years and love the smell, but they are a lot of work to make. These sound like they are easy to make and look great.